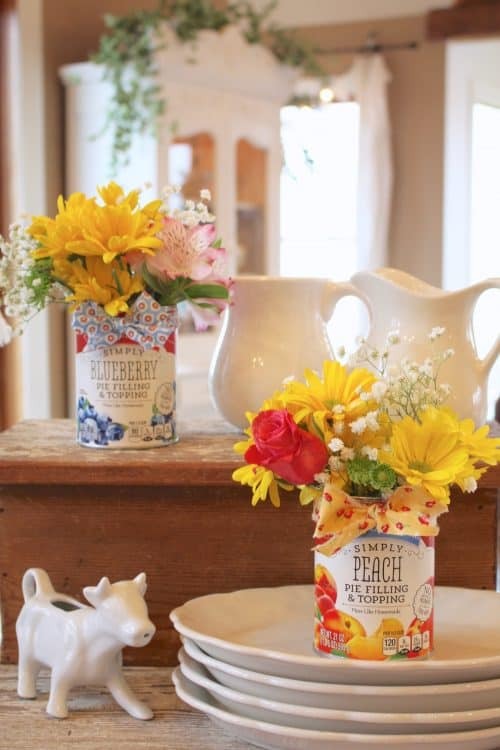 I always LOVE Sugar Pie Farmhouse days on Southernplate! Aunt Ruthie is back with another one of her heart warming, smile inducing, joy filling ideas! Well, Howdy neighbor! I’m chatting over the fence from Branson, Missouri! 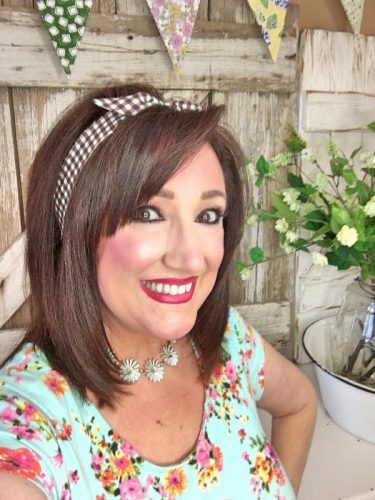 I’m so thankful Christy has invited me to share some easy and fun decorating tips with you! 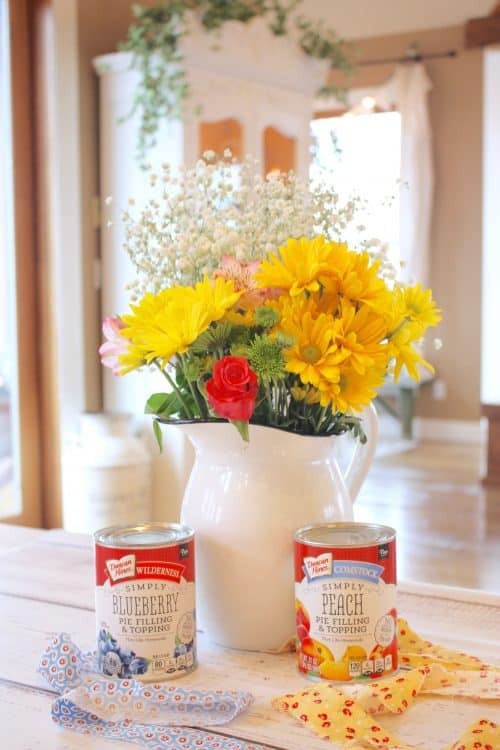 It’s a wonderful privilege as a homemaker to make our homes cozy and cheerful for our families. Even if you live alone, it’s still important to take good care of yourself and to make your home a place that brings you comfort and joy! I don’t know about you, but winter isn’t my favorite. Maybe because I was born and raised in southern California and I’m used to relatively sunny and warm weather year round along with lots of green lawns and trees. I now live in Southern Missouri and as much as I love the fact that we have four seasons, winter brings a lot of gray and brown. So I’ve come up with an easy way to brighten up a gloomy, cold day in a hurry! I was at the market the other day and saw these darling cans of pie filling. I love the labels! The style is so sweet and old fashioned. The charming illustrations of the fruit made me think of springtime and summer…and that made my heart happy! 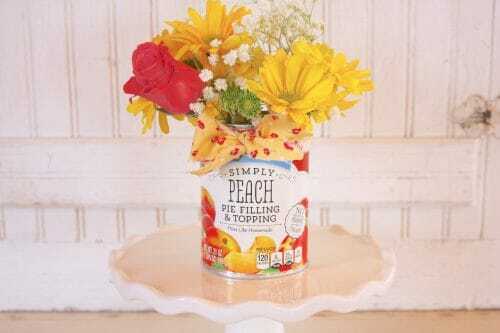 Then I thought they would make adorable flower vases! And why not make some hand-pies with the filling to boot! 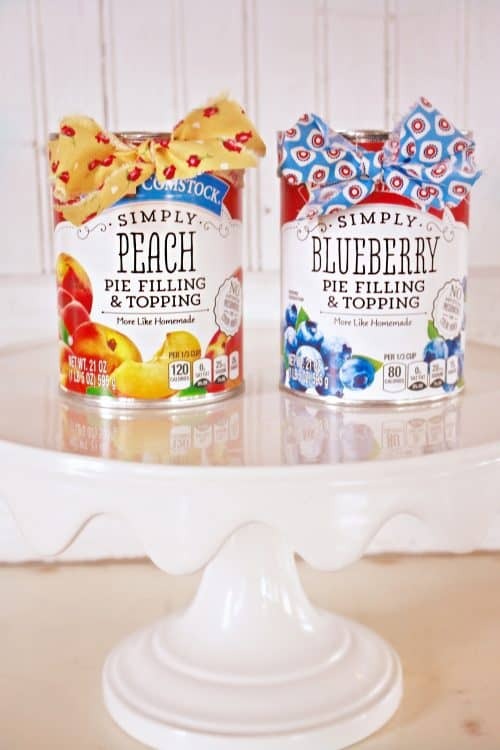 I thought it would be cute to tie a ribbon around the top, but I didn’t have any that coordinated with the colors on the cans. Then I had a lightbulb moment! Ah-ha! I did have some fabric scraps that I could rip into a length of ribbon. And that’s just what I did! After I emptied and rinsed out the cans, I folded the strips of cloth lengthwise in half and then tied cute little rag bows around each can! Then I filled the cans with water and cut my grocery store flowers to fit inside. 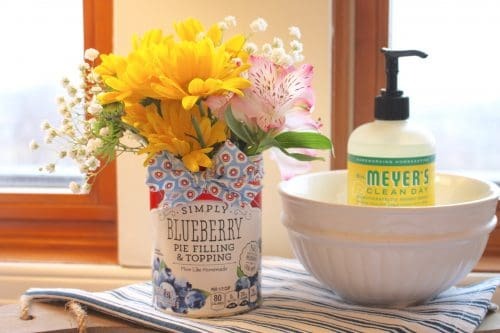 I put the Blueberry Can next to my kitchen sink to put a twinkle in my eye while I’m washing dishes! Truth be told I did not end up making the hand-pies because I did not care for the filling after tasting it. I think it would need some doctoring up to taste better. 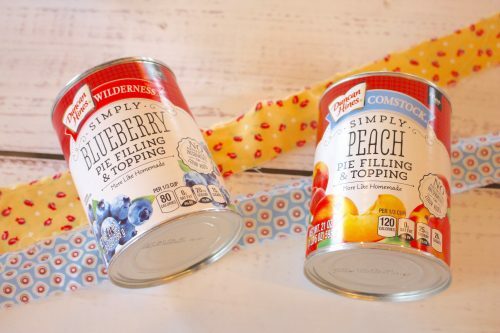 I always make my pie filling from scratch but when I saw these darling cans I decided to give it a try. 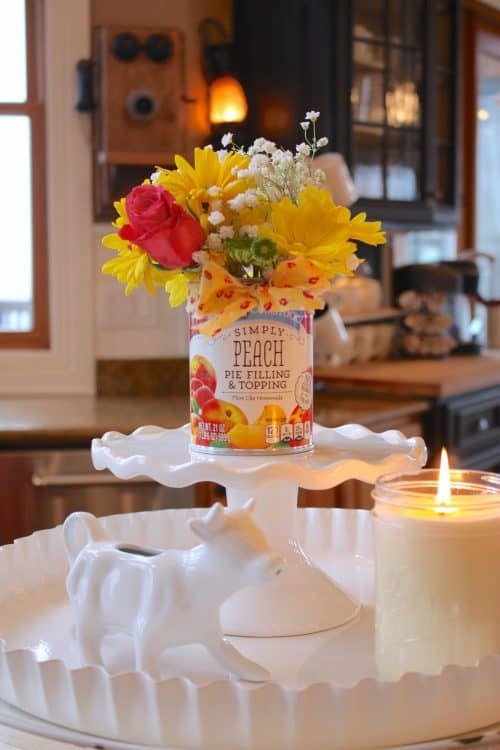 But still, for $2.98, it’s a cheap price for a cute flower container! Lol! And I can use it over and over! I suppose you could use the topping to spoon onto ice-cream! Another thought is you can use any can that you might have in your pantry. If you don’t like the label You can take it off and tie a cute rag bow around it and fill it with some cheery daisies! Try it! I will make your heart sing! 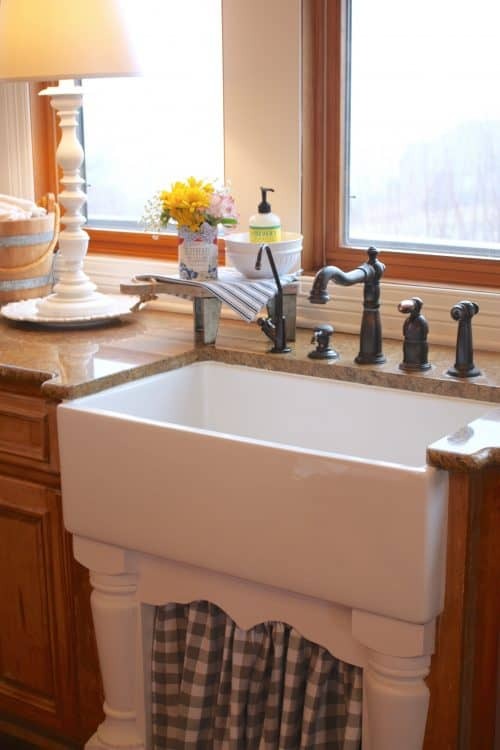 It doesn’t have to cost a lot to add a little cheer to the nooks and crannies of our homes! I do believe we should be happy and thankful for each season…but I also think it gives us hope to anticipate the joys of warmer days, bright flowers and birdsong. I sure do hope this post bright a smile to you! Let me know in the comments below! Come and visit me sometime at Sugar Pie Farmhouse! Oh my goodness! How adorable. I also love your honesty, the pie filling is not great but these are too cute. Thank you for sharing. Isn’t she the best?! Thank you for being here! Very cute and happy looking! Love it! Very cute and springy! My little guys and I are growing a plate of grass (a long-time January/February tradition in our home! You NEED grass by then!) for a burst of spring. Grass is perfect for little guys because it’s tough and “pettable”, but, seeing these, I’m thinking some of us older ones would benefit from some fresh flowers! If the snow ever stops and we get to go shopping again… Thank you Aunt Ruthie and Christy! back and check out her channel. Being born and raised in the Alabama (born in Montgomery, but lived most my life in southern part, aka LA, Lower Alabama) I do not care for winter. It is gray for sure, this idea will brighten up any winter blues. Thank you for sharing this beautiful idea. 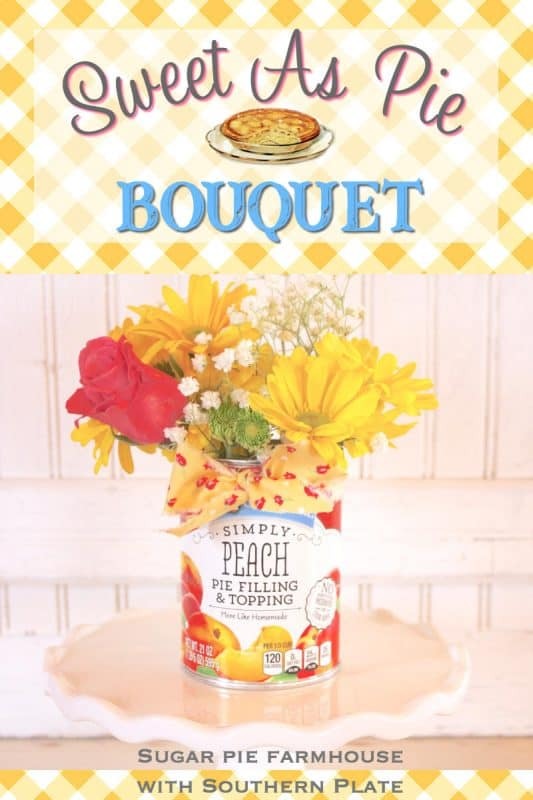 Now I have to go to the grocery store and look for pretty cans of fruit pie filling…….have a happy day!! Thank you, I hope you have a happy day too Susan!! !